You probably know Daniel James from cool Milwaukee based bands like Chinese Telephones and Ramma Lamma. When I heard he had done some solo demos, I figured they would be good. I figured right! Working under the name Indonesian Junk (best band name ever! ), James home-recorded four songs Prince style - playing all the instruments himself. He liked the tracks enough to make Indonesian Junk an actual band - recently bringing Johnny Cyanide (bass) and Mark Fraaza (drums) into the fold. I imagine the trio will be recording together soon. In the meantime, Dan has made his solo demos available for free download. They're very much up my alley, and I'm super impressed that Dan learned how to play drums just so he could undertake this project. That's true commitment! I'd describe these songs as ballsy powerpop/punk with a slightly dark edge. I don't know if the lyrics are based on personal experience or not, but there's a pretty intense heartbreak theme looming large. And it goes without saying that the lead guitar work is absolutely smokin'! Even with fairly blatant nods to the likes of the Stooges ("Shake It With You") and Dickies ("You Messed Me Up"), Indonesian Junk come off sounding pretty darn unique. Listening to these demos, I don't get the feeling that I've heard these songs a million times before. Dan sounds a little like Joey Ramone on "Now That It's Over", but I don't think that's intentional. A song title like "Shelly Shelly Don't (Break My Heart)" might have you expecting cutesy power pop. But it sure isn't cutesy, and it freaking rocks. Given that these are demos, this is just a rough idea of what Indonesian Junk is going to sound like in a few more months. Give these guys a couple months to get tight and write some more songs, and surely they'll deliver a debut recording that will knock all of our socks off! I am so psyched to hear more! 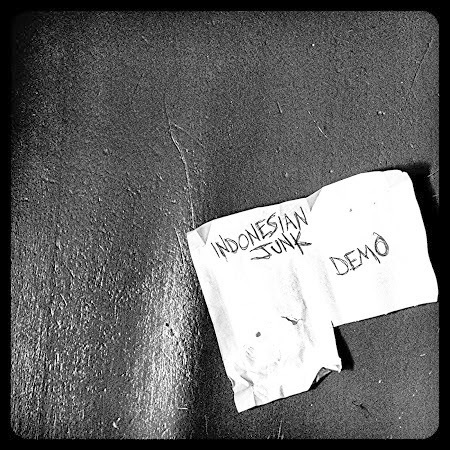 I beleive "Indonesian Junk" is taken from the Cheap Trick song "surrender"
You are correct. Mommy's alright. Daddy's alright.